Gain access to a dangerous Daedric library. "As long as the lenses are active, the doors won't open. I'm thinking sabotage is in order." I discovered the Library of Dusk, an Ayleid ruin, just beyond the Hollow City. 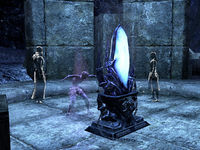 Several treasure-hunters and scholars in the service of the Mages Guild have been trapped within the ruins by Daedra. Talk to Kireth Vanos' Projection. Enter the Library ruins and find Kireth Vanos. "A projection of the famed dungeon-delver Kireth Vanos appeared before me. I should talk to the projection." As you travel on the road near the the Library of Dusk, a spectral figure of a Dunmer will appear some distance away and then walk up to you. Speaking the figure, will reveal it to be the Projection of Kireth Vanos, who is need of some help for herself and her companions. "You're a real live person, aren't you? I thought I was all alone out here. I bet you came from that city over there. Why can I see through you? "I'm a projection, silly! My brother and I are part of the Mages Guild expedition. Well, freelancers, really. We got separated from the others as soon as we arrived in Coldharbour. But we're not slacking off. We're investigating this old library." "We drew straws and I wound up on watch duty. When I saw Daedra seal the entrance, I found another way inside. To rescue my brother, you know? But now I'm trapped, too. There's a lot of magical projection stuff in here. That's how I'm talking to you." "The Mages Guild gathered a team of the best dungeon-delvers from across the three alliances, members of the Undaunted, just in case they ran into any ruins or relics. My brother went into the old library with a couple of other treasure-hunters." And that's when the Daedra showed up? "You got it. Look, my brother's the expert, but I think the Daedra are using the projection lenses to spy on the people trapped in the library. As long as the lenses are active, the doors won't open. I'm thinking sabotage is in order." So I should destroy the lenses? "That's my thought! I'll provide whatever help I can from in here. I can tell you this: one of the other scholars, she called this place the Library of Dusk. Couldn't wait to start exploring. Please hurry. Whatever the Daedra want, it can't be good." 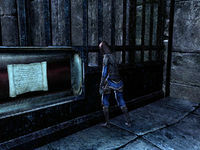 Kireth Vanos wants you to destroy the lenses both to stop any Daedra spying and to hopefully unlock the library. After agreeing to help her, you will receive Raynor's Divination Rod, the device will allow Kireth to stay in contact with you while you destroy the three Daedric Lenses. The lenses will be on platforms on the outskirts of the ruins' exterior. As you travel between the lenses, you will need to deal with a variety of Daedra wandering the ruins, including several types of Dremora and Cold-Flame Atronachs. As you approach a lens, the projection will appear and follow you, once a lens is destroyed, Kireth will attempt to show you what is happening within the library. Projection of Kireth Vanos: "Is it working? Can you see me? I'll try to show you what's going on inside the library while you smash those lenses. Here goes …." As the projection channels power into the broken lens, images of Ayleid scholars appear then fade away. Projection of Kireth Vanos: "Did you see that? I'll make some adjustments while you search for the next lens." Once you destroy the second lens, Kireth will appear having made some adjustments and she will try again, being confident that her adjustments have fixed the problem. Projection of Kireth Vanos: "It's working! I switched the widgets with the gadgets and that seemed to do the trick. Now let's see if I can get a view into the other part of the library …." Instead of the library, the projections show a bunch of dancing Dremora. Projection of Kireth Vanos: "That was … unexpected. I must be doing something wrong. I'll give it one more try while you hunt down the last lens." Once you have destroyed the final lens, Kireth will try again to get a clear image of her brother's current situation. "All right, I think I made the proper adjustments. Now let's see if I can spot my brother …." Projection of Kireth Vanos: "All right, I think I made the proper adjustments. Now let's see if I can spot my brother …." The resulting projection won't be Raynor but it does show the current situation of Telenger the Artificer and Lady Clarisse Laurent who are also trapped in the library. It appears that Raynor has already fallen under an enchantment while the other two are succumbing to it. After the scholars' projections fade, Kireth will wonder why she hasn't been effected by the magic yet. She will then tell you to meet her in the gallery of the ruins. Projection of Kireth Vanos: "A spell? Why haven't I been affected? Wait, I just heard the door unlock! It should be safe now. Come meet me in the gallery at the top of the ruins." "I found Kireth Vanos inside the gallery. She seems upset. I should speak to her." The entrance to the Library is located in the near center of the ruins' exterior. Once you reach it, head down the stairs and enter the Library to find Kireth. You will not need to look for long, as she will be near the stairs leading to the entrance, fruitlessly banging on a window and trying to get her brother's attention. Speak with Kireth to see what is wrong. In way of payment she will give you some gold and a unique staff called the Dungeon-Delving Staff. You can continue speaking with her if you want to help her save the ensorcelled scholars. A projection of the famed dungeon-delver Kireth Vanos appeared before me. I should talk to the projection. Kireth Vanos, her brother, and a few other dungeon-delvers are trapped inside the Library of Dusk. Kireth thinks that if I destroy the Daedric lenses set up around the area, I can get the locked doors to open. 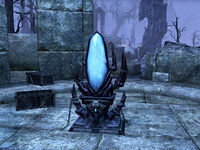 I destroyed the Daedric lenses and unlocked the door to the gallery where Kireth was trapped. She assures me it's safe now and wants me to meet her inside the ruins. I'm inside the gallery overlooking the library. Now I should find Kireth Vanos. Finishes quest I found Kireth Vanos inside the gallery. She seems upset. I should speak to her. This page was last modified on 8 January 2019, at 14:35.